Anyways being in Italian class currently I'm interested in different ways of learning the language. Studying the lyrics, translating they lyrics, and mouthing the words while listening (I am a terrible singer) has helped a great deal. Also, three songs by Gino Paoli "La Gatta", "Sapore di Sale", and "Senza Fine" have been useful and fun. I plan to do it some more with other Italian artists. 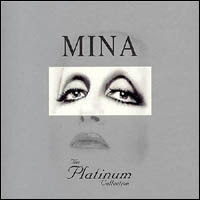 I eventually got my hands on the Mina "Platinum Collection" and I'm listening to it every day just to keep the sound of the language in my head every day until we leave.